In this classic work, George Perle argues that the seemingly disparate styles of post-triadic music in fact share common structural elements. These elements collectively imply a new tonality as "natural" and coherent as the major-minor tonality that was the basis of a common musical language in the past. His book describes the foundational assumptions of this post-diatonic tonality and illustrates its compositional functions with numerous musical examples. 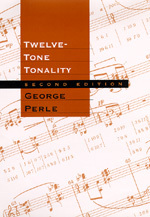 The second edition of Twelve-Tone Tonality is enlarged by eleven new chapters, some of which are "postscripts" to earlier chapters—clarifying, elucidating, and expanding upon concepts discussed in the original edition. Others discuss new developments in the theory and practice of twelve-tone tonality, including voice-leading implications of the system and dissonance treatment.